This chapter is titled, ” ‘We Are Met on a Great Battle-Field’: Race, Memory, and the Gettysburg Address.” Here Spielvogel tells us Gettysburg is “a pivotal symbol of Civil War memory” [p. 25] Gettysburg was the site of a great battle, but it was also the site of what is perhaps Abraham Lincoln’s best known speeches, the Gettysburg Address. 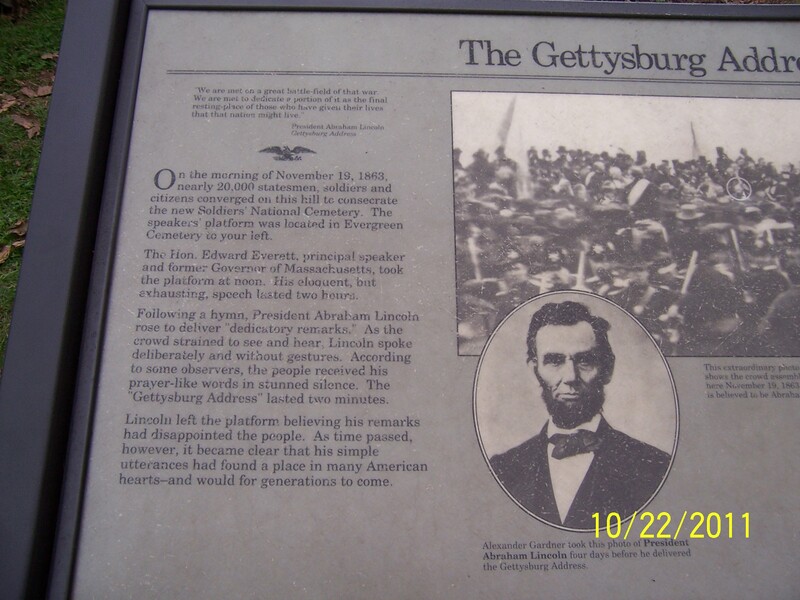 The Gettysburg Address is the main focus of this chapter–not only the address itself but also how the address has been used to shape public memory. He shows how by using carefully selected fragments of the address, either the emancipationist or the reconciliationist interpretation can be supported. “Developed in the late nineteenth century, the dominant national ‘reconciliationist’ memory of the war accelerated reunification between northern and southern whites by emphasizing white martial heroism to the exclusion of blacks and questions of racial equality. Bitter partisan memories of the Civil War gave way during this period to a dominant interpretation of the battlefield–this commemorative tradition’s symbolic center–as a site of regional healing and transcendence. … reconciliationist memory invited audiences to ignore or forget race-related causes and consequences of the war by commemorating the equal valor and heroism exhibited by white Union and Confederate soldiers in battle.” [p. 26] He shows how Lincoln’s address has been used to support this view. The epainesis, or praise for the fallen, of the address [yes, I had to look it up], which is contained in lines 6-15, has been used to claim Lincoln was praising the courage and sacrifice of the soldiers of both the Union and the confederacy. Most of us today would say Lincoln was only speaking about the Union soldiers here, but the reconciliationists appropriated the speech to refer to soldiers of both sides. The second collage he describes uses the phrase, “A final resting place for those who here gave their lives that that nation might live.” He claims, “With regional reconciliationist memory now intact as an interpretive frame from the first collage, visitors are invited to infer that ‘those who here gave their lives’ are Union and Confederate soldiers eulogized by Lincoln.” [p. 32] The photograph here is of the National Cemetery, and Spielvogel says, “If interpreted in conjunction with the photo of the seventy-fifth veterans’ reunion, then, the recent photo of the National Cemetery in the second collage invites visitors generations removed from the war to create a memory of the Gettysburg dead as immortal and peacefully reconciled former foes instead of Union and Confederate soldiers who killed each other in battle. This clever juxtaposition insinuates not only a fraternal bond between the former adversaries but an eternal one as well.” [p. 33] I may be missing something here, but I find this interpretation to be completely off base because it seems to me to be common knowledge that only United States soldiers are supposed to be buried in national cemeteries, and the Gettysburg National Cemetery is no exception. Yes, I know there are supposedly a couple of confederate soldiers buried there, but if true they are the exceptions, not the rule. I think he is going way too far here in his interpretation. It seems as though he thinks the National Cemetery has both Union and confederate soldiers in roughly equal numbers rather than only Union soldiers with perhaps one or two confederates inadvertently included. 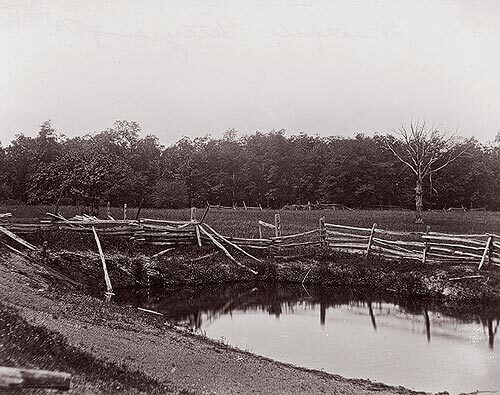 Spielvogel claims this photo was taken on land that is now part of the National Cemetery. This part of the field isn’t near Cemetery Hill at all. This certainly puts a kink in Spielvogel’s interpretation, because the last part of his interpretation of the rhetoric here depends on this being part of the National Cemetery. He says, ‘The collages certainly make visitors aware of the sanctification of the cemetery through martial sacrifice, but they would be hard-pressed to find information at the park about why Wills and Curtin chose to ‘preserve’ that specific location on Cemetery Hill. Brady’s wartime photograph, if placed in the first collage rather than the last, might lead visitors to more readily connect Lincoln’s words to his original partisan wartime context and audience. If so, then visitors would be invited to read Lincoln’s other fragments as tributes to just Union–rather than Union and Confederate–dead. Instead, the first photo helps contextualize Lincoln’s address within the commemorative tradition of regional reconciliation. The second photo, a more recent color photograph of the cemetery, connects reconciliation to the present, while the final linkage between the ‘present’ and the battlefield’s ‘origins,’ represented by the third photograph, functions to preserve reconciliation as part of a fixed, ‘unchanging’ landscape.” [p. 34] Personally, I don’t buy this interpretation at all. I’m sure he’s right that this is one valid message, provided of course his identification of the third photograph is correct, which it isn’t. However, I believe there may be other valid interpretations of the message provided by the collages, and it seems to me the National Park Service is not trying to send the message he is saying is being sent. I don’t think anyone can seriously take Lincoln’s words as referring to anyone other than Union soldiers and Union dead. Maybe I’m wrong, but I don’t see that his interpretation is correct. Spielvogel says, “The preceding analysis of three highly visible and symbolic collages located in the main lobby of the visitor center suggests that the Park Service ‘preserves’ the battlefield and cemetery landscape to reflect the ideals of a particular public memory of Gettysburg rather than its actual 1863 historical appearance.” [p. 35] This proposition is one I accept. Certainly our interpretive choices say things about us and about what we feel is important. So the Park Service’s choices reflect the Park Service’s goals. 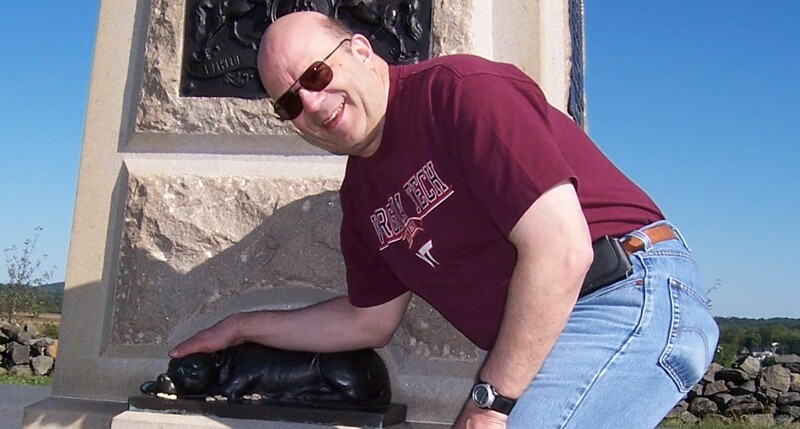 He says, “The Park Service’s approach to public history is unquestionably fair-minded and historically accurate. In fact, their representation of the past typically follows the guidelines of history rather than commemoration, although this analysis is beginning to suggest that the Park Service, when they do rely on commemoration, can confuse it as history.” [pp. 35-36] I agree completely that the Park Service is fair-minded, and I am willing to accept the last part of this claim as well. The next section concerns the famous electric map. He tells us the electric map “mixes both history and commemoration in its interpretation of the address.” [p. 39] He gives a short history of the electric map until it was taken out of service in 2008 with the opening of the new Visitor’s Center. 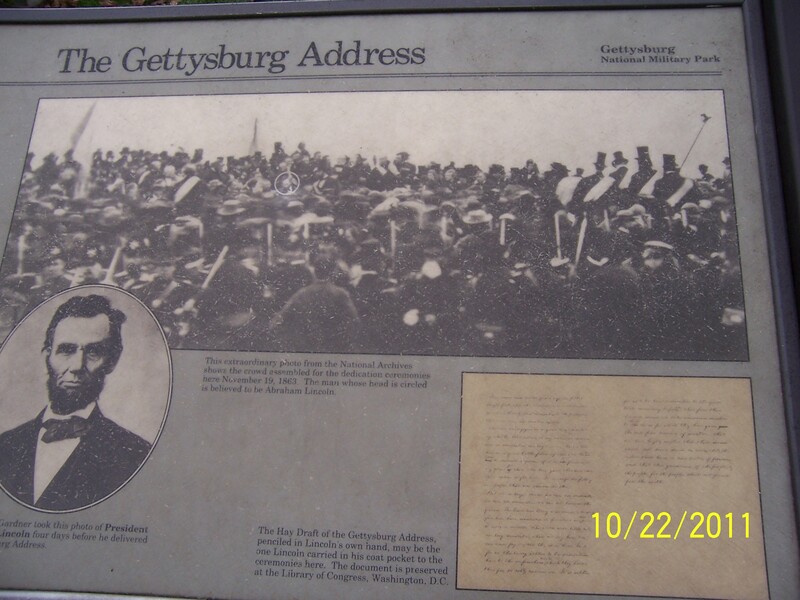 He says, “The electronic map is relevant here because it uses fragments from Lincoln’s address to conclude the presentation by summarizing the historical details surrounding the dedication ceremonies of November 19 and using the address as a way to commemorate the battle.” [pp. 39-40] He next talks about the voiceover narrative for the electric map. “The voiceover narrator uses a combination of military history and reunion sentiment to create a public memory of the battle as an important Northern victory that featured unparalleled acts of Southern bravery and heroism.” [p. 40] I find this section very persuasive. There was certainly an attempt to appear “balanced” by finding praise for both sides of the battle. We see this a lot in the interpretations surrounding the Pickett-Pettigrew-Trimble Charge. The bravery shown by the confederate troops making the charge is always highlighted. Following the electric map, Spielvogel next discusses the Cyclorama. He links the Cyclorama to the lost cause myth. “Gary Gallagher argues that the Lost Cause was so convincing that it ‘transcended region to make its way into popular American understanding.’ Popularized nationally by films such as Gone with the Wind and writers like Shelby Foote, the myth, according to Alan T. Nolan, has the following ‘anatomy’: liberty, independence, and states’ rights were the causes of secession, not slavery; slaves themselves were faithful and happy; Northern abolitionists were provocateurs; the South had not been defeated by physically overwhelmed by superior Northern resources and manpower; and the superior leadership of ‘saintly’ generals such as Lee and Stonewall Jackson and the gallant heroics of the typical Confederate soldier compensated for the lack of resources and manpower and almost turned the war in their favor were it not for the blunders of General Longstreet at Gettysburg.” [pp. 43-44] I think many in the NPS would agree. Indeed, during the Future of Civil War History Conference former Gettysburg superintendent John Latscher said the NPS taught the lost cause myth all the way into the 1990s. Spielvogel next talks about the new visitor’s center and museum, giving a short introduction giving the story of how it came about. He talks about the film, A New Birth of Freedom and the new exhibits which “reflect the agency’s commitment to including African Americans as part of the war’s broader story and legacy.” [p. 51] The new Visitor’s Center and Museum reflect a more emancipationist memory of the war. Spielvogel talks about the film itself and about the new exhibits in the museum and visitor’s center and how they create a new version of memory about the war, one that is more inclusive. He says, “At one level, it would be easy to criticize the Park Service for its belated revisionism, although the agency acknowledges it is reactive to changes in historical scholarship initiated by academics with more financial support and training.” [p. 54] He also says, “Perhaps it is fair to say that the agency could have been (and still could be) more reflexive about its own role in perpetuating a racially exclusive memory of the war that it now deems antiquated. While it might be unrealistic to expect the agency to reference its own duplicity in sublimating racial equality as one of the war’s unfinished legacies, such contradictions are now visible at Gettysburg, a site of essentially contested memory where visitors can see field markers, monuments, and waysides that venerate the men whose racism is now the subject of criticism at the Visitor and Museum Center.” [p. 54] On the one hand, I agree completely with him about the contradictions in interpretations caused by the new film and exhibits and the older markers and waysides. As they came from different eras, they reflect different political and sociological viewpoints. On the other hand, I think he is a bit too harsh in accusing the NPS of duplicity. I don’t see where there was a conscious effort to deceive people or to be anything other than honest in interpretation. But the older interpretation did reflect the sensibilities of the times in which they were made. Overall I found this chapter had much to commend, and I learned a great deal; however, there were, in my opinion, some key errors and some overreaching that tended to detract from the chapter’s good points. Interesting blog entry – a lot of work went into this. Thanks for the photo image. You might want to add a page with your recommended books or starred reviews. As always, thanks for sharing all this stuff with us. It is a great help. That’s something to consider, Pat. Thanks.